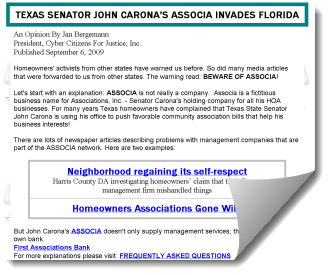 Homeowner’s Associations Archives - Neighbors at War! And the new Homeowners Association laws in Colorado just aggravate the problem. All HOA officers and managers must now be state licensed. Hmmm, who provides the testing and licensing? Well, the largest organized crime syndicate in the country, of course! I don’t need to provide you with their three initials. No more HOA mandates for Kentucky bluegrass. That’s not a bad change, although most Colorado homeowners don’t use it anyway. Yes, folks, it’s another million dollar embezzlement from trusting homeowners in California. At least the Feds are finally taking action. A Federal Grand Jury has indicted Chris Barna for stealing $950,000 from Homeowners Associations that once trusted him. Although he hasn’t been convicted yet, I have no problem calling him a dirtbag. Prosecutors say he misappropriated 342 checks, spent the money on nice things for himself, and manipulated the records for M&C Association Management. Here’s an HOA embezzler who made a pretty good score for himself. 53 year old Dale Palmer was in a position of trust with dozens of Homeowners Associations in Missouri. He operated a firm called “Homeowner Association Services (HOAS), and his take was $750,000. Nice work if you can get it. Palmer has been preparing false business statements for his 3 member homeowner associations for the past couple of years. His excuse to police was that he was very poor at managing money for HOAs, and he just could keep all that cash straight. 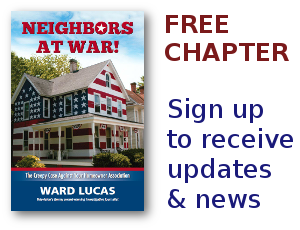 Homeowner Association Beaten by a Pig! No Comments on Homeowner Association Beaten by a Pig! Wilbur the Pig’s family had to spend thousands of dollars defending their pet pig. So did the Harris County, Texas HOA, which did everything it could to have Wilbur thrown to the wolves. Wilbur is a Vietnamese pot-bellied pig, an extremely intelligent species which has been bred as housepets. Tens of thousands of pig owners say they make marvelous companions. But The Thicket at Cypresswood Community Improvement Association thought otherwise. Just the thought that the Alex Sardo family was keeping a non-traditional pet in their home threw the HOA into histrionics. Threats to sue, threats to poison, threats of vandalism, threats to seize the Sardo home and sell it at auction. 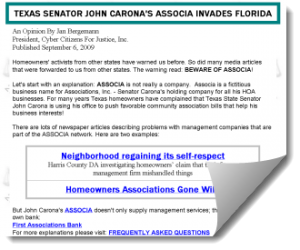 CalHomeLaw.org is one of the heroes in the heroes in fight against abuse by Homeowners Associations. It costs a few bucks to join, but the average member will be paid back many times in advice and information. It’s designed for California residents but every homeowner in the country can profit from their wisdom and research. Anyway, in their 2/25/12 email, CalHomeLaw notes how debt collectors cut their own throats in a meeting of the California Legislature. The Radcliffs were an elderly disabled couple in Calaveras County. For some reason, the couple overlooked a $120 annual assessment. The debt collector, Coast Assessment Collection, claimed the couple had been legally served with papers. During questioning, the company admitted that it had stapled the notice of foreclosure to a tree on the far side of the Radcliff’s property.